In the case of a well maintained and aesthetically pleasing garden, the pertinent details include edges, borders and other tucked away or hard to reach parts of your lawn, which if neglected can become overgrown and untidy. To ensure a pristine finish and a luxurious looking lawn, then, it is important to use a brushcutter regularly. Honda’s UMK435 LE, for example, offers a level of power and manoeuvrability few comparable machines can match, perfect for either precise trimming or clearing thicker areas of scrub and thicket. Perhaps the most notable element of this machine’s design is Honda’s powerful 35cc GX35 mini four-stroke petrol engine, designed to be both fuel efficient and remarkably potent. The Honda UMK435Producing a maximum of 1,200 watts of power at 7,000rpm, the UMK435 LE also benefits from vibration dampening technology, including an anti-vibration clutch system, to ensure that the machine is quiet running and comfortable to use. To enhance this level of comfort further, the UMK435 LE is supplied as standard with a comfort harness and features an ergonomically designed D-loop handle with an integrated barrier bar for added protection. The versatility of the UMK435 LE is also impressive, with two cutting options making it easy to tackle a wide range of jobs. For precision trimming, the UMK435 LE is fitted with an efficient nylon line cutting system, featuring quick and easy tap-and-go line advancement and a long-lasting metal line cutter. When faced with thicker areas of scrub, brambles and nettles, meanwhile, the UMK435 LE’s three-tooth blade option provides a powerful alternative and will make heavier clearance jobs a much simpler matter. 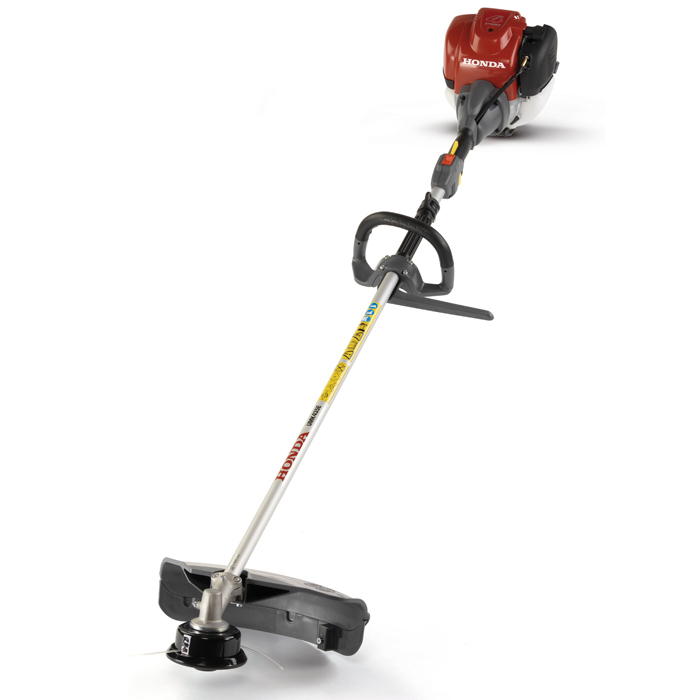 With a long service life and outstanding reliability underlined by Honda’s world-renowned engineering expertise and a specially toughened transmission head, as well as optional hedgetrimmer and pruner attachments for outstanding versatility, the UMK435 UE is an impressive piece of machinery that would serve any dedicated gardener superbly. D-Loop Handle - Simple and compact control, with a comfortable soft skin. A bike handle type model is also available. 35cc OHC 4-stroke engine - The powerful, yet ultra-quiet, smooth and efficient 4-stroke starts first time with no mixing of fuel and oil needed. Nylon spool and 3-tooth blade - Ideal for clearing thicker and more demanding undergrowth. A range of optional blades are also available to suit a variety of tasks. Easy Start - Easy starting 4-stroke engine with low recoil effort, gives outstanding smooth operation and reliability. Intuitive control - Ergonomically designed controls for ease of use. Unique 360o lubrication system - Allows the brushcutter to be used and stored through a full 360o incline. Safe and comfortable - Supplied with a double harness and safety goggles for comfortable use over extended periods.